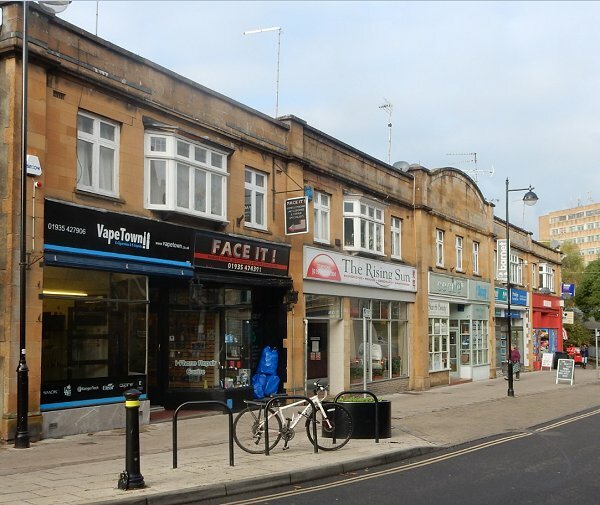 What is today's Park Road was originally a narrow lane called Pitney Lane that took its name from the manor of Kingston Pitney, whose boundary ran along its length on the northern side (the southern side was the manor of Hendford). Pitney Garden was an open space named as such in Georgian times and appeared on Watt's maps of 1806 and 1831 as well as Bidder's map of 1843. The garden ran along the western side of Cattle Market (today's Princes Street) from Pitney Lane almost as far as the entrance to Court Ash on the east. 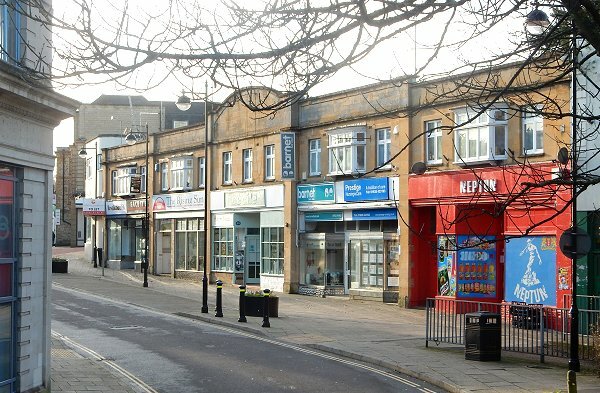 Although advertised as Yeovil's New Shopping Centre in 1930 (see below) the parade of shops built in Princes Street and wrapping around the corner into Park Road are not really architecturally homogenous. The central building of the new Parade in Princes Street featured a domed parapet mirroring that on E Price & Son's music shop around the corner in Park Road but the building next to Price's premises and the later Art Deco style corner building, although attractive, were simply infill buildings. This photograph was taken from Bide's Gardens in the 1920s and shows the northern end of Princes Street / southern end of Kingston. In 1831 Pitney Garden took up the whole area at right as far as Park Road (indicated on this image by the flank of three-storey Old Sarum House visible just right of centre). 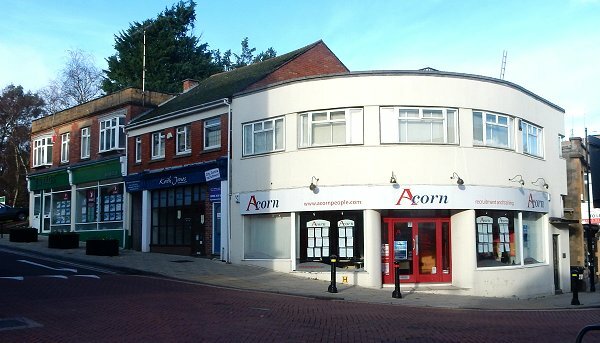 The building at right is the shop-front of the sales rooms of Hill & Boll's carriage works, built on the site of the earlier Pitney Garden and the predecessor to the 'new' shopping centre of 1930. 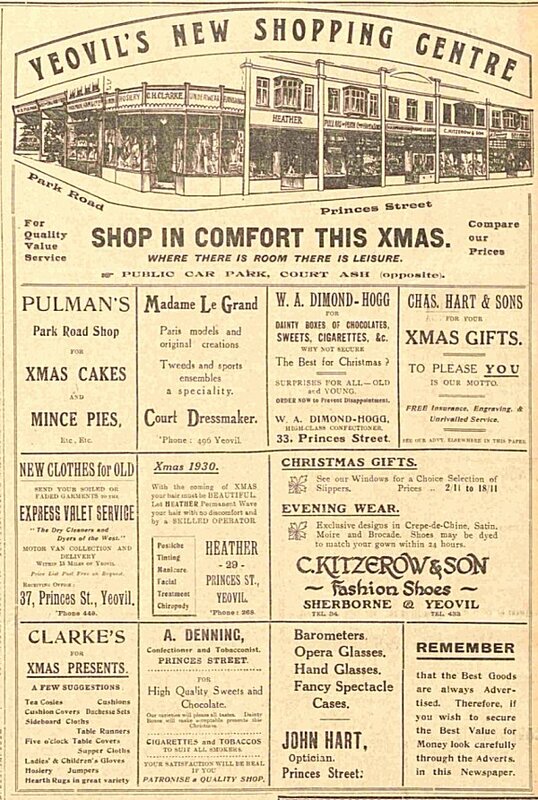 The advertisement for "Yeovil's New Shopping Centre" from the 12 December 1930 edition of the Western Gazette. Some of the names will bring back memories for many older Yeovilians. 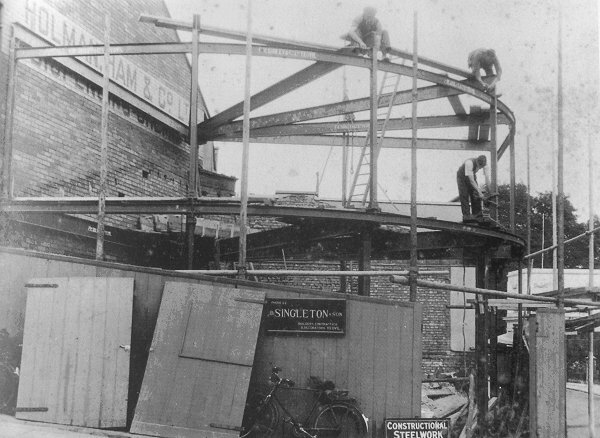 This photograph shows the curved structural steelwork being erected in the mid-1930s for the present Art Deco style building on the corner of Park Road and Princes Street, replacing the corner premises of CH Clarke seen in the advertisement above. This new building was built for Burtol Cleaners, photographed below. The steelwork was erected by FW Sibley & Co, while the main contractor for the project was D Singleton & Son of Yeovil. 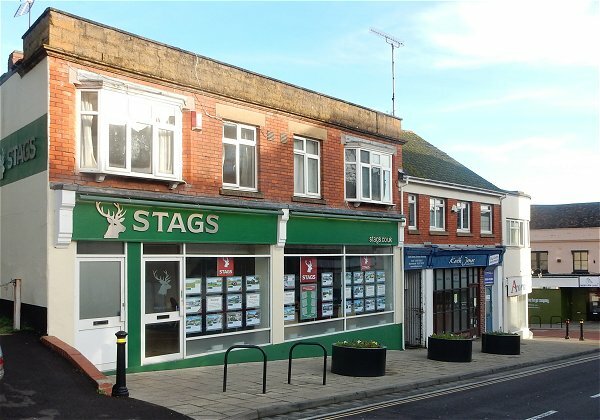 The building was later occupied by Griffith & Palmer estate agents. Looking from Princes Street along Park Road, this 1960's photograph shows Park Motors with the large 'Exide' sign on its side. 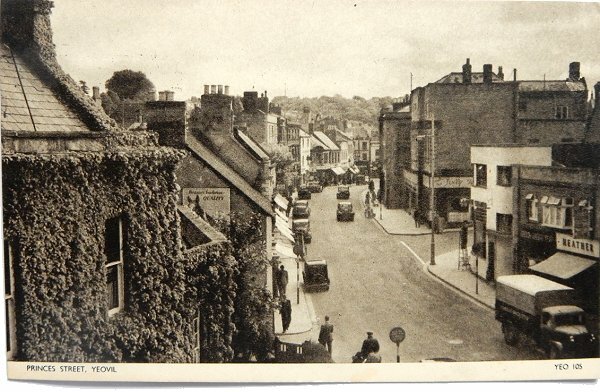 The building at centre with the rounded parapet is E Price & Son's music shop that sold pianos and other musical instruments. The shop with the awning was chemists Holman & Hann, later G Titman the Chemist's. 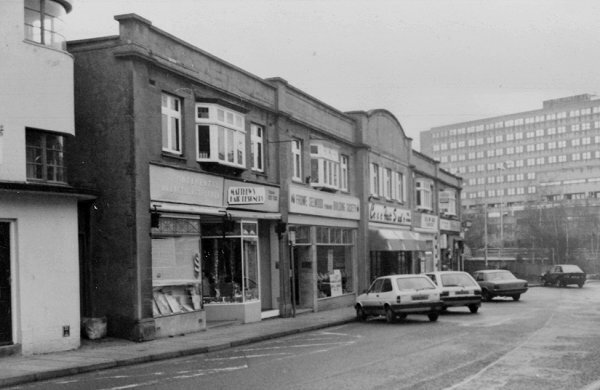 Park Motors was demolished when Queensway was built but Price's building survives (albeit with a now-straightened parapet), as do the other buildings to the right. 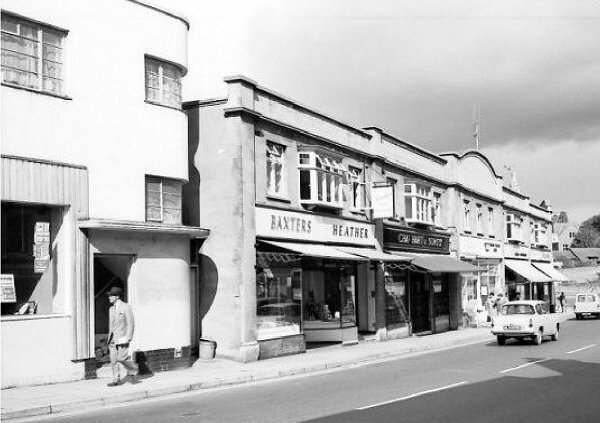 Again photographed in the 1960s, the Art Deco style corner building at extreme left and the main parade of shops from 1930 all remain today. The northern end of Princes Street, featuring Yeovil's New Shopping Centre of the advert above, seen in a postcard dated 1961 (although the serial number 'V7781' dates the photograph to between 1942 and 1952). 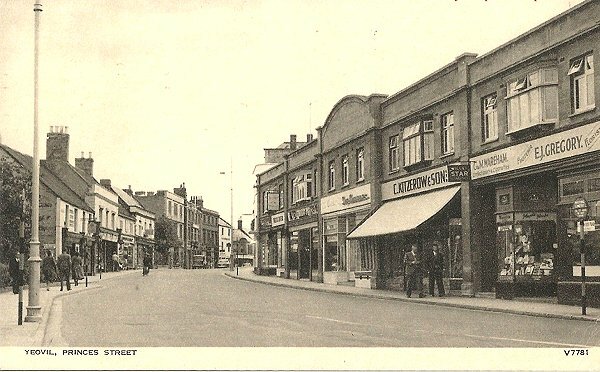 The three shops at right were Kitzerow & Sons (shoe shop), C&M Wareham (confectionery & cigarettes) and EJ Gregory (fruiterer & florist). Thanks to Roger Willmott who recalled "Although we lived in Tintinhull, my mother always bought her fruit and vegetables from Gregory's and my Clark's shoes from Kitzerow's. Kitzerow's had an X-ray machine that you placed your feet in so you could see how well the shoes fitted. Would never be allowed today." Thanks to Stella Trent "Loved Kitzerow, during the war they sold American shoes, for some reason the name Joyce shoes comes to mind." and to Patricia Ann Smith "Kitzerow's had a beautiful old rocking horse in the children's department." A postcard dated 1933 showing the Princes Street entrance to Bide's Gardens. Note the cars in Vincent's showrooms at left. An unusual view of Princes Street taken from the roof of Vincent's car showroom (now Batten's) with the 1930s Art Deco corner building and the start of the 'new' parade of shops at right. The postcard is dated 1962. 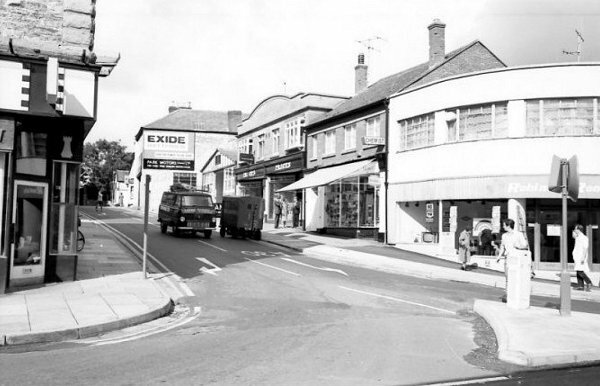 The parade seen in 1985; the nearest shop was 'Continental Hairstyling by Mathew's Hair Designers' and next door was the office of the local branch of the Frome Selwood Building Society. 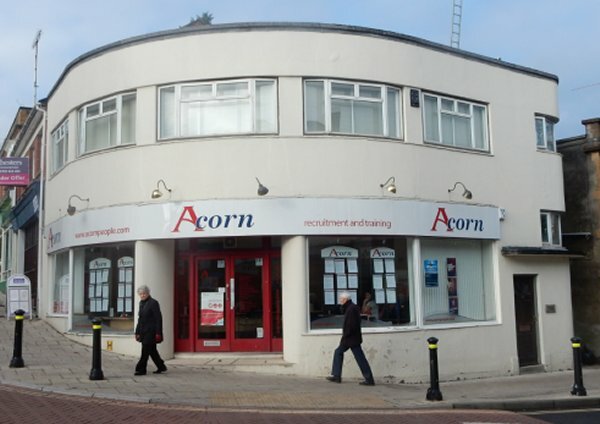 The lovely 1930's corner building photographed around 1995. .... and seen in 2016. 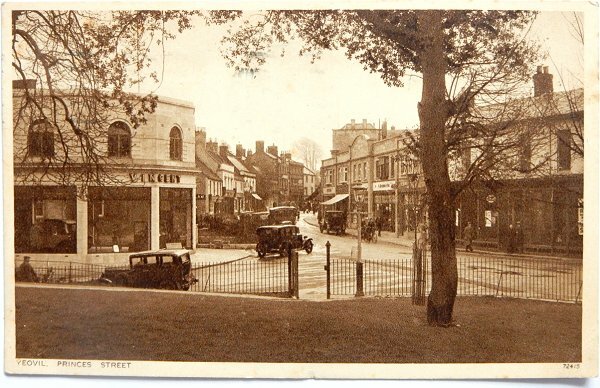 The 'new' shopping centre of 1930. At centre the domed parapet mirrored that on E Price & Son's music shop around the corner in Park Road. Photographed from Court Ash in 2016. The main run of the 'new' shopping centre of 1930, photographed from Princes Street in 2016. 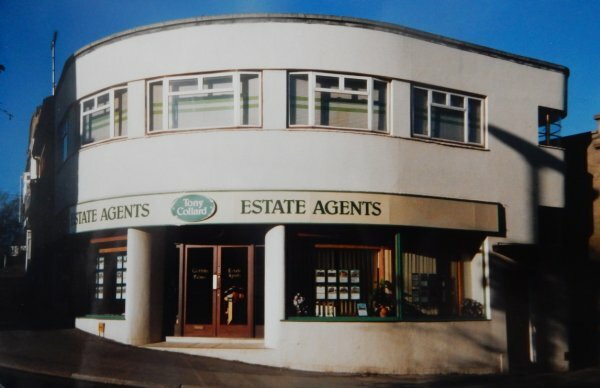 The 'Art Deco' building on the corner of Park Road (at left) and Princes Street. Photographed in 2016. .... and the Park Street section of the wraparound shopping centre. Photographed in 2016.